Scale your retail and wholesale orders for increased, flexible growth and efficiency. Login to multiple panels for fulfillment is time consuming. 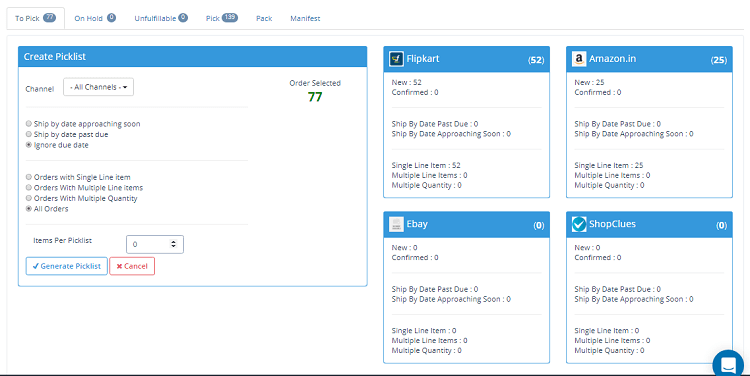 Unified operation dashboard helps you keep track of order and fulfill them in unified process. Reduce labor required for fulfillment. Spend less time training staff on order fulfillment. Optimized and fully automated workflow for picking packing and dispatch from your warehouses. App based picking and system directed packing helps improve fulfillment efficiency by 30% and reduce human errors in fulfillment. Process your bulk offline orders efficient. Pick items using picklist, open package and scan items to add to package, close package and print pack slip. Scalable order management platform for managing and growing across multiple sales channels. Uncover sales trends and track profitability with unified data and comprehensive reporting. Deliver flexible fulfillment across sales channels, warehouse locations and meet customer demands in a fast and efficient manner. Logging into multiple panels is time consuming. Unify and process all your channels from a single panel efficiently.